We’d love your help. Let us know what’s wrong with this preview of Trina Bell's Humming Summer by Silke Stein. Twelve-year-old Trina Bell has finally had enough. Why should she spend another dull summer watching Great-Aunt Roswinda lawn bowl and nibble cucumber sandwiches while her estranged father has all the fun? This year, she won’t let him get away with his usual excuses. To her surprise, she succeeds. Her dad, the famous wildlife photographer, agrees to take her with him to th Twelve-year-old Trina Bell has finally had enough. Why should she spend another dull summer watching Great-Aunt Roswinda lawn bowl and nibble cucumber sandwiches while her estranged father has all the fun? This year, she won’t let him get away with his usual excuses. To her surprise, she succeeds. Her dad, the famous wildlife photographer, agrees to take her with him to the Canadian rainforest. Trina’s triumph is short-lived, however; soon she finds herself alone on Vancouver Island, in a strange apartment building that may not be what it seems. But when she befriends Moss, the wisecracking three-legged dog living across the street, and becomes involved in a puzzling case of vanishing hummingbirds, events take an astonishing turn. 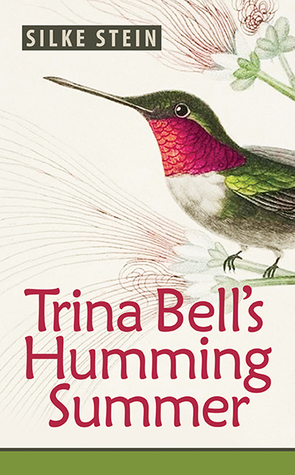 To ask other readers questions about Trina Bell's Humming Summer, please sign up. A delightful story of a girl, a dog, and many, many hummingbirds, in something of a wild-life lovers' tour of Victoria BC. There is an underlying mystery that appears secondary to the narrative to add excitement, but the tale is richly told and the imagery is superb. In a new take on the absent parent syndrome, Trina escapes the boredom of life (and holidays) with her Great-Aunt (I hope my great nieces won’t suffer the same fate) to join her widowed father in Vancouver Island. Except that having A delightful story of a girl, a dog, and many, many hummingbirds, in something of a wild-life lovers' tour of Victoria BC. There is an underlying mystery that appears secondary to the narrative to add excitement, but the tale is richly told and the imagery is superb. In a new take on the absent parent syndrome, Trina escapes the boredom of life (and holidays) with her Great-Aunt (I hope my great nieces won’t suffer the same fate) to join her widowed father in Vancouver Island. Except that having her to stay has little effect on his wilderness adventures, and she finds herself alone most of the time. As the blurb says, she befriends a dog, which also has an intriguing take on the ‘friendship’ element, and meets real people, some of whom are rich and eccentric. Actually most of this tale is eccentric, but its the kind of eccentricity that I love, fed by curiosity in a new world, and I hope a great many middle grade kids will too. The adventures and mysteries are spot on for a kid alone in a relatively safe environment, who discovers hummingbirds, and their strange behaviour towards her, so wants to find out why they behave as they do. I would like to thank the author for sending me an electronic copy of 'Trina Bell's Humming Summer in exchange for an honest review. What a lovely story and one that is totally different from my usual read. This was a magical story which I felt as if I was there and it certainly had imagination working overtime. What a wonderful relationship between father and daughter. I could feel the warmth between the two! Loved the animals and the touch of mystery. I would recommend to young and not so young I would like to thank the author for sending me an electronic copy of 'Trina Bell's Humming Summer in exchange for an honest review. This is one of the most enjoyable books I have read in a long time! It is both magical and real at the same time. The story is about a girl named Trina who goes to Vancouver and finds herself on a quest to save the hummingbirds. It has a strong sense of place. As I read, it just flowed along beautifully and I was able to relax into it. Along with the fantasy, there is an educational aspect to it about both hummingbirds and Vancouver. Trina Bell misses her father. She’s twelve years old, but never spent much time with him. She constantly tries, but he’s hardly paying her any attention. He’s left her with an aunt and travels the world photographing wildlife. Trina longs to have an adventure herself and the idea of another boring summer in Brighton with her aunt's friends and nobody her own age fills her with dread. She does everything she can to convince her father to take her with him. That’s how she ends up on Vancouver Isla Trina Bell misses her father. She’s twelve years old, but never spent much time with him. She constantly tries, but he’s hardly paying her any attention. He’s left her with an aunt and travels the world photographing wildlife. Trina longs to have an adventure herself and the idea of another boring summer in Brighton with her aunt's friends and nobody her own age fills her with dread. She does everything she can to convince her father to take her with him. That’s how she ends up on Vancouver Island. Will Trina finally have the wonderful summer she’s longed to have for years? What do a three-legged dog, a slim green and creamy white hummingbird named Sweet Pea, and a twelve-year-old girl have in common? Answer: they're all central characters in a delightful new children's book called Trina Bell's Humming Summer. When Trina's famous wildlife photographer father takes her to a tiny British Columbia island after years of pleading on her part about always being left alone, she gets more than she bargained for -- but in a pleasant way. She meets Moss, the dog, and an ensem What do a three-legged dog, a slim green and creamy white hummingbird named Sweet Pea, and a twelve-year-old girl have in common? Answer: they're all central characters in a delightful new children's book called Trina Bell's Humming Summer. When Trina's famous wildlife photographer father takes her to a tiny British Columbia island after years of pleading on her part about always being left alone, she gets more than she bargained for -- but in a pleasant way. She meets Moss, the dog, and an ensemble cast of other animal characters large and small who share a common trait. Or, at least, they talk to Trina, and that's a good thing, as it propels her into an unlikely adventure brimming with imagination and a good deal of inventiveness on the part of the author. When Sweet Pea falsely accuses Trina of bird-napping -- she's been seen around the island carrying a clear bottle with a tiny hummingbird named Arrow in it -- Trina explains that the bottle is Arrow's home, and she and Moss were only giving him an outing. But the bird-napping threat is real, Sweet Pea explains, as thirty-one hummingbirds have disappeared on the islands over the past few days. Can Trina and Moss help solve the mystery? she asks. And so Trina and the three-legged pooch fall in with a swarm of hummingbirds searching for the real perpetrators of this insidious plot. Suspicion falls immediately on Professor Charles Finch, whose vast collection of stuffed hummingbirds throw Sweet Pea into a birdy swoon. Trina and her friends start weaving their investigational web around the odd old man. There are some priceless turns-of-phrase in the book. Among them: "Driftwood is scattered all over the shoreline like the bleached bones of dinosaurs." And: "Moist air hit my skin, startling like the icy breath of an open freezer." And my favorite, spoken by the dog: "There are two kinds of people, Treenabelle: the happy and the haunted." Is the professor guilty of absconding with all the missing hummingbirds? Will Trina's father finally stay home and realize what a treasure he has in this bright, bubbly girl? And, what will come of the budding romance between Trina and Kale, a boy she meets on the island? Download a copy for your preteen daughter and see for yourself! Synopsis: "Shooting ghost bears? Twelve-year-old Trina Bell has finally had enough. Why should she spend another dull summer watching Great-Aunt Roswinda play lawn bowling, while her father has all the fun? This year, she won't let him get away with the usual excuses. To her surprise, she succeeds. Her dad, the famous wildlife photographer, agrees to take her to the Canadian rainforest, on a quest for the elusive Kermode bear. Trina's triumph is short-lived, however; soon she finds herself in a Synopsis: "Shooting ghost bears? Twelve-year-old Trina Bell has finally had enough. Why should she spend another dull summer watching Great-Aunt Roswinda play lawn bowling, while her father has all the fun? This year, she won't let him get away with the usual excuses. To her surprise, she succeeds. Her dad, the famous wildlife photographer, agrees to take her to the Canadian rainforest, on a quest for the elusive Kermode bear. Trina's triumph is short-lived, however; soon she finds herself in a city on Vancouver Island, dumped in a strange apartment building that may not be what it seems. But when she befriends Moss, the three-legged dog living across the street, and becomes involved in a mysterious case of vanishing hummingbirds, events take an astonishing turn..."
This book is a bit challenge for me to write a review. I actually finished the book a long while ago. I just couldn't figure out how to write the review for this well-written novel. I think it is mainly because I am just not the right audience for this type of novel. I was expecting something entirely different. I thought it would be a bit of adventure story where white bear was included. But it was entirely about the hummingb This book was provided by the author in exchange for an honest review. This book is a bit challenge for me to write a review. I actually finished the book a long while ago. I just couldn't figure out how to write the review for this well-written novel. I think it is mainly because I am just not the right audience for this type of novel. I was expecting something entirely different. I thought it would be a bit of adventure story where white bear was included. But it was entirely about the hummingbirds. Don't get me wrong, the way the author describe the hummingbirds were fantastic. It provide me a different perspective toward the hummingbirds. Not too long ago, the hummingbird was literally in front of my face and flying around in the air as if nothing around the bird existed. It was beautiful. I could remember the color of the hummingbird. It was green with blue chest. Just gorgeous. A couple years back, I actually saved a hummingbird when it collapsed on the ground. I immediately grab a garden gloves and carefully pick up. I thought it was dead at the beginning so I was intending to put it away from the dogs. But to my surprise when I nudge on the side of the bird softly, it woke up! Flew right off of my hand. It was amazing experience. This book confused me. I wasn't sure if it was intended to be a fantasy story because the young girl was able to communicate with any animals. Even done it front of people and I wondered was it a normal things that all people could have done it? It wasn't well-defined of how she was able to communicate with animals and whether the people knew it or they didn't. That was what bothered me the most. And the story went on and on. It got me so tired and hardly keep my eyes open as I was reading the novel. As I said above, I wasn't the right audience. Nevertheless, it was really well-written. I just wish the author would explain a bit more about the girl's ability. Trina Bell (12, aka Treenabelle) & Great-Aunt Roswinda, are from Hamburg, Germany. Aboard the Royal Commodore (cruise ship) Trina, Roswinda & Moss (3-legged dog, narrator) plan to visit the wilds of Victoria (Vancouver Island), Canada. If you enjoy science or biology, especially bird watching (ornithology) this adventurous book is for you. What mysterious case are Trina & Moss trying to solve? I did not receive any type of compensation for reading & reviewing this book. While I rece Trina Bell (12, aka Treenabelle) & Great-Aunt Roswinda, are from Hamburg, Germany. A very awesome book cover, great font & writing style. A very well written HS age adventure book. It was very easy for me to read/follow from start/finish & never a dull moment. There were no grammar/typo errors, nor any repetitive or out of line sequence sentences. Lots of exciting scenarios, with several twists/turns & a great set of very unique/colorful characters to keep track of. This could also make another great HS age historical scientific adventure movie, PP class presentation, animated cartoon, or mini TV series. Not enough color visual pictures I thought. That said it wasn’t for every kid, so I will rate it at 4/5 stars. Trina Bell is a precocious pre-teen girl who is looking for an escape from her humdrum life in England with her aunt. She also longs for the chance to recapture her father's attention. In one fell swoop, she gets her wish for both, but the adventure she finds is not the one she expected. Author Silke Stein has the gift all writers covet; the ability to bring characters and places to life with words. She weaves a story that will have you rooting for Trina and her hummingbird friends, aching for T Trina Bell is a precocious pre-teen girl who is looking for an escape from her humdrum life in England with her aunt. She also longs for the chance to recapture her father's attention. In one fell swoop, she gets her wish for both, but the adventure she finds is not the one she expected. Author Silke Stein has the gift all writers covet; the ability to bring characters and places to life with words. She weaves a story that will have you rooting for Trina and her hummingbird friends, aching for Trina's reunion with her distant father and planning a trip to Victoria Island. I absolutely loved the story. It was exciting and sweet. I especially liked the father/daughter relationship. It's easy to relate to and really tugs at your heart strings. The story also had a very fun Alice and Wonderland fantasy element about it. It is very fresh and unique and will have a ton of readers excited about having something new and different to read. A wonderful, endless summer adventure. Think 'Harriet The Spy' meets furry and feathered friends.